Looking at a picture I snapped this afternoon, which I’ll share in just a moment, I was reminded of a few unusual injuries I’ve gotten through the years. The first of two weird things happened when I was about fifteen. I somehow managed to scrape the back of my ankle on the footstool in the living room. Being a teenager, I didn’t think anything of it—until my calf started to hurt. Bad. Turns out the scrape wasn’t as simple as I’d thought, and the infection had spread nearly to my knee. At the time, we lived about a block from a hospital, and with my father at work with our only car, it was walk or wait for him to get home. So my mom and oldest younger brother slung my arms around their shoulders and practically dragged me to the emergency room. I couldn’t put any weight on the leg at all at that point. Once there, and diagnosed, I was given a triple strength penicillin shot. In the hip. By a very handsome young doctor. Can we say mortified? And then I was given a prescription for more antibiotics and sent home. 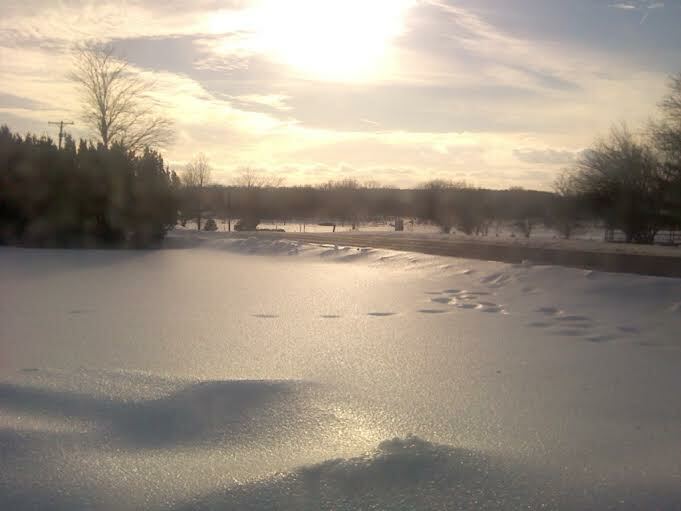 My front yard this afternoon—after a coating of freezing rain yesterday. My poor legs were freezing, but that wasn’t the worst of it. I felt something sting after one step, looked down and saw blood dripping down my shin. The snow had actually cut my leg … but amazingly enough, hadn’t put a run in my nylons. My folks had bought a house in the country, and that’s where we had Thanksgiving that year. One thing about the country is that it’s really dark at night, something I was about to become well acquainted with. For some reason, my sister and I were the ones who volunteered to haul the dinner trash out to the burning barrel my dad had. I’m not sure why, but Dad had surrounded the barrel with a circle of cement blocks, leaving a space wide just enough to walk through. Cement blocks are really hard to see in the pitch dark, and not being used to taking trash out at their house, I managed to trip over one of them—spraining my ankle. Last but not least, and perhaps the weirdest “injury” I’ve ever had happened when my kids were really small. I was working as a short order/pizza cook at a restaurant. All burgers and sandwiches came with chips if customers didn’t order fries. I’m probably the only person you know who cut their finger enough so it bled … with a potato chip. Yes, folks, it’s true. I reached my hand into the bag—and cut my finger on chip. I had to put a Band-Aid on it to stop the bleeding so I could finish out my shift. How do my strange injuries rate compared to yours? Feel free to share in the comments below. October9,2014 I was walking in my living room to take my little American Eskimo dog out when I stepped on her little nylar bone (didn’t see it) with my right foot. I fell on my right knee and went flying into a wall knocking myself out, spraining my right wrist and breaking my left ankle in three places. When I came to I called my husband (cell phone was in my pocket fortunately) and told him “I’ve fallen and can’t get up” The really bad part is the left knee has been replaced twice as they didn’t do it right the first time and it is making my recovery very difficult. This is the 7th surgery on the left leg. ENOUGH ALLREADY! Yikes! Oh, Marge…how awful! I hope this is the last surgery you ever have to have on that leg. I agree. Enough already!! !